Alex here with this week’s Macro Musings. As always, if you come across something cool during the week, shoot me an email at alex@macro-ops.com and I’ll share it with the group. High Quality Trading Is Episodic, Not Continuous — Tyler explains how harvesting alpha must be done through high impact strikes during periods of rare market dislocations. Aswath Damodaran put out an interesting read on the relationship between interest rates and stock valuations. He discusses the impact (or lack thereof) of the Fed funds rate on longer term interest rates. And then goes over how the spreads between risk assets, their risk premia, play off one another and what this means for their expected returns going forward. He then takes a look at where these risk spreads are now and runs through a number of potential future outcomes. Understanding the interplay between risk spreads is a very important concept for a macro trader to grasp. And it’s one that’s not always straightforward. We’ve written some about this here. Here’s an excerpt from the article and the link. As you can see in this picture, holding all else constant, and raising long term interest rates, will increase the discount rate (cost of equity and capital), and reduce value. 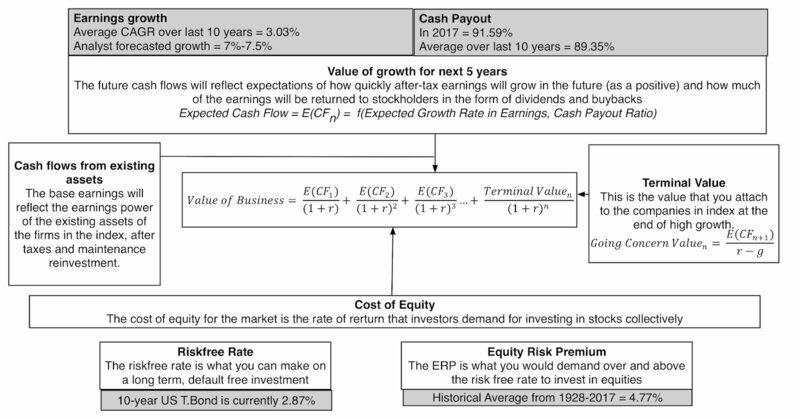 That assessment, though, is built on the presumption that the forces that push up interest rates have no effect on the other inputs into value – the equity risk premium, earnings growth and cash flows, a dangerous delusion, since these variables are all connected together to a macro economy. 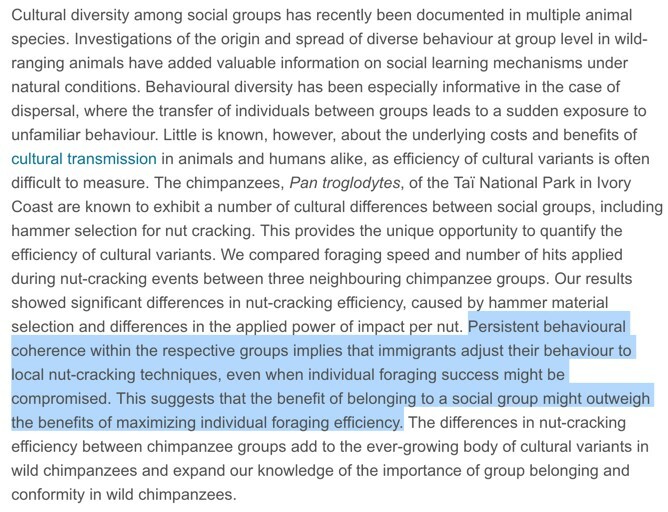 I read an interesting paper this week, titled “Costly culture: differences in nut-cracking efficiency between wild chimpanzee groups”. The piece looks at the lengths chimpanzees will go to in order to fit in with their peer group. Here’s the abstract with the results highlighted and link to the paper. The instinctual draw to fit in and be accepted by social groups is immensely powerful; not just in chimpanzees but in us humans, as well. This is likely one reason why the best investors/traders I know tend to be natural mavericks, who are often socially awkward, and have little concern over fitting in and being accepted by others. They’re not hindered by the desire for approval and therefore find it easier to run counter to the herd. Lastly, here’s a short and fascinating article from The Observer on recent progress being made in making nuclear fusion a net energy producer — a feat, that if accomplished, would reshape the world and everything in it. Here’s the link. Oh… and one more thing. 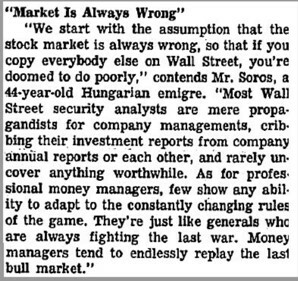 Check out this great tweet thread of newspapers clippings from a 1975 WSJ interview with George Soros and Jim Rogers. Here’s a section of it. This week I watched a talk that Michael Mauboussin gave at Google on the subject of his book The Success Equation: Untangling Skill and Luck in Business, Sports, and Investing (h/t to Brandon our analyst for sending this my way). I will watch, read, or listen to everything Mauboussin does. He’s one of my favorite market thinkers and I always come away with a new insight or perspective from his work. This talk was excellent and has a lot of valuable nuggets for traders and investors in it. It is well worth an hour of your time. You can find the link here. I also just ordered the book and will let you guys know my thoughts once I read it. 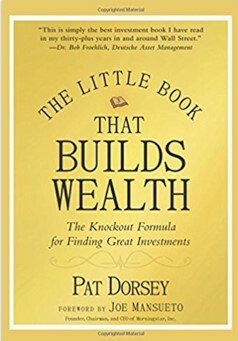 This week I read The Little Book That Builds Wealth by Pat Dorsey. I like this book series. The one by Joel Greenblatt is great, as was this one. I have an affinity for short books. Most books have 1-2 good ideas but they take 300 pages to say what could be said in 150. Anyways, we’ve talked about Dorsey in these pages a number of times. He formerly ran the equity research department for Morningstar before branching out and starting his own fund. He’s done some great interviews on Patrick O’Shaughnessy’s podcast. The guy can breakdown Moats (aka. Competitive advantages) better than anyone else I’ve come across. The book is certainly worth a read. Which can be done in one sitting. Here’s an excerpt. Moats are structural characteristics inherent to a business, and the cold hard truth is that some businesses are simply better than others. Great products, great size, great execution, and great management do not create long-term competitive advantages. They’re nice to have, but they’re not enough. The four sources of structural competitive advantage are intangible assets, customer switching costs, the network effect, and cost advantages. If you can find a company with solid returns on capital and one of these characteristics, you’ve likely found a company with a moat. I think this chart is one of the most important charts in macro land at the moment. It shows the US’s relative equity momentum versus the rest-of-the-world’s (ROW) and the US dollar. Currencies mostly move off of speculative flows and thus tend to chase performance. The dollar selloff which began in earnest in 2017 was accompanied (and partially driven) by ROW outperformance. There was also the unwind of the carry trade as higher shorter term US interest rates made the spread unprofitable. 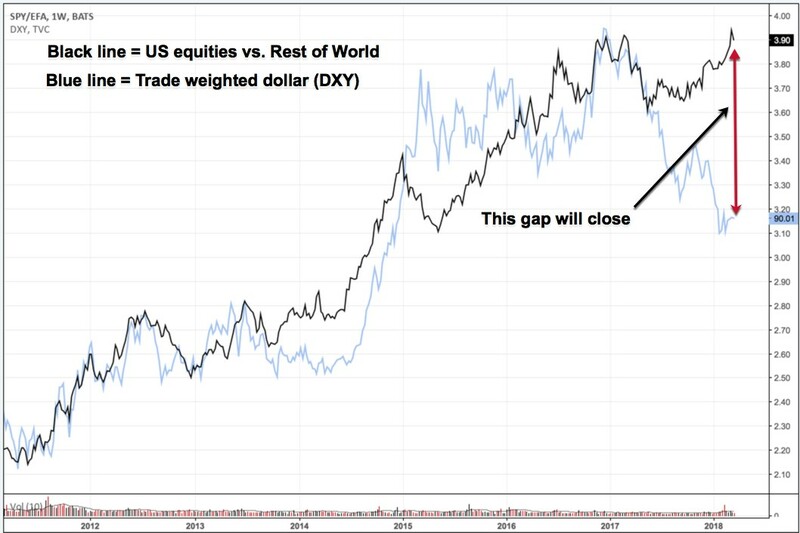 This in combination with ‘dollar smile’ concept, where the dollar tends to perform poorly when global growth is strong and synchronized and the US’s is just so-so (which epitomizes 2017), and extreme US capital concentration + long dollar positioning, all led to the quick dollar rout we’ve seen over the last year. With economic surprise indices maxed out, there’s plenty of opportunity for disappointment going forward. It’s unlikely that 2018 sees the same volatile-less synchronized global growth as last year. And with the interest rate spreads and relative equity momentum so in favor of the dollar — not to mention the one-sided short positioning and popular bearish narrative. I’d think we’ll see the dollar do some work to close this relative momentum gap soon. And this will have a recursive impact on commodities, emerging markets, volatility and so on. The dollar is the global lynchpin. It’s always important to watch where the greenback goes. This week I’ve been digging into a little known home builder called NVR Inc. (NVR). William Thorndike, the author of one of my favorite investing books The Outsiders, which is about the best capital allocators to have ever played the game. Was asked at a Google Talk which company/management team today, would fit The Outsiders model. His answer was NVR. Global value fund, Peters Macgregor, has a great write-up plus video on the company that you can find here. NVR is certainly an impressive company that’s consistently put up some amazing numbers. They’ve also been aggressively repurchasing shares for the entirety of the company’s existence — the float is now only 3.4m shares! I’m not particularly bullish on the housing market right now. I think we’re nearer to the end of this demand cycle than we are to the beginning. 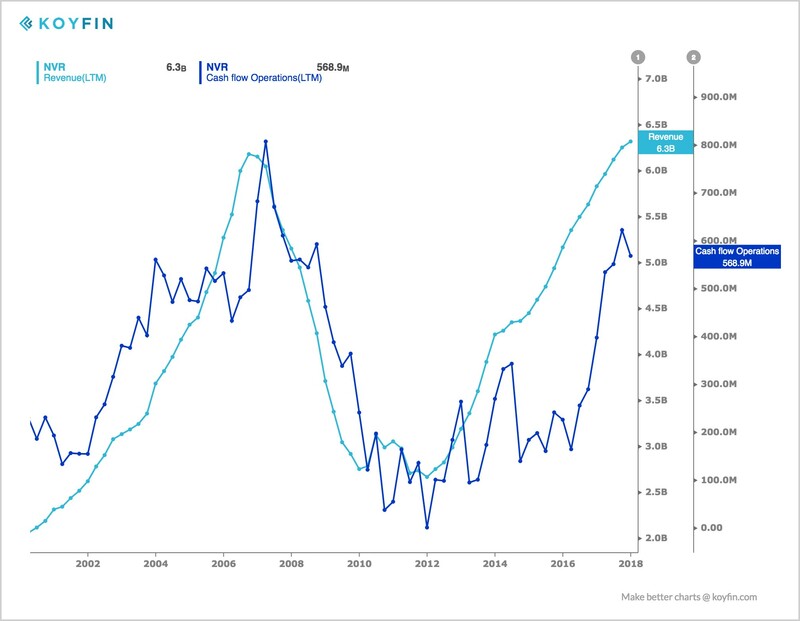 Looking at the numbers for homebuilders we see decelerating growth in both revenue/cash flows. Which is typical in a late-cycle environment. And then technically speaking, the stock looks extremely vulnerable. Especially if it breaks below its 50-week MA (red line below). 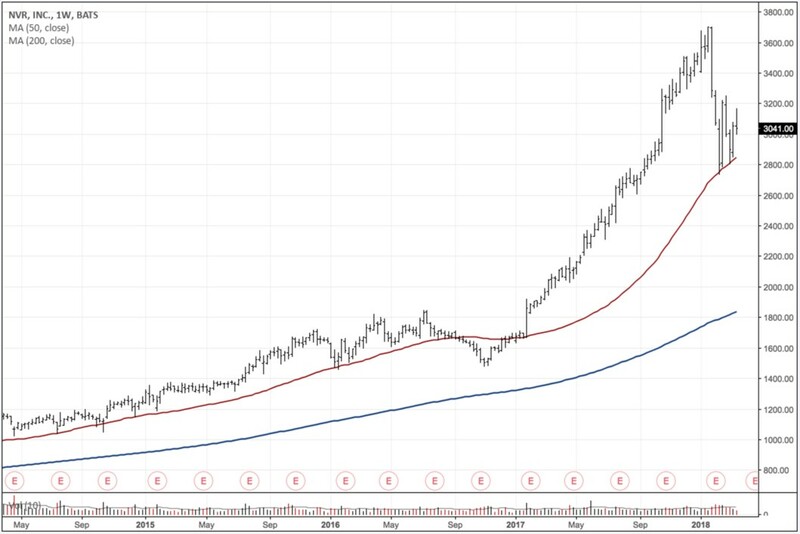 Regardless, I like this company and the management and will be keeping it on my watchlist for when I become more constructive on the US housing market. It may be readily conceived that if men passionately bent upon physical gratifications desire greatly, they are also easily discouraged; as their ultimate object is to enjoy, the means to reach that object must be prompt and easy or the trouble of acquiring the gratification would be greater than the gratification itself. Their prevailing frame of mind, then, is at once ardent and relaxed, violent and enervated. Death is often less dreaded by them than perseverance in continuous efforts to one goal. If you’re coming into this game with the intent of mastering trading so you can get the lifestyle (lots of money, a boat, and a pet giraffe). You’ve lost before you’ve even started. Because this game is hard. You have to have the deep seated passion for the game itself. You have to love the work. Everything else… all the potential rewards of being a successful trader… are little in the ways of being a motivating factor. Those who are just here to try and turn a quick buck, will over the long-haul, always lose to those of us who live to just play the game. If you’re not already, be sure to follow us on Twitter: @MacroOps and on Stocktwits: @MacroOps. I post my mindless drivel there daily. Here’s a link to our latest global macro research. And here’s another to our updated macro trading strategy and education.